Frank McKinney was planning a family vacation in the summer of 2004. His penchant is for extreme experiences so he selected the hottest place he could find, Death Valley, in July. He wasn't much of a distance runner at the time but decided to go for his regular six mile run. Not surprisingly, he began having "heat issues". He staggered into the General Store at Furnace Creek in search of replenishment. The clerk looked at him and said, "You better get back out there, you're in last place!" That's how McKinney, 44, of Delrey Beach, FL, first heard about the Kiehl's Badwater Ultramarathon. Immediately, he was intrigued. He did his research and heard that you need to finish a 100-mile race to get serious consideration of your application to Badwater, so he ran one, in less than 24 hours, without ever having done a marathon. McKinney did get selected for the 2005 race and finished in just over 48 hours. He returned and buckled in 2006. His original plan for 2007 was "never again" but it soon changed into "never say never" and he's in the race for the third time. 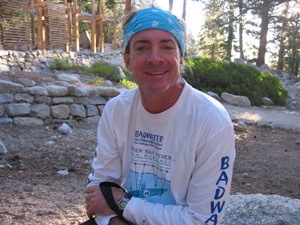 But McKinney is much more than a Badwater veteran. He is a real estate entrepreneur and best-selling author. As he says, he creates works of art with his properties and sells them to the rich -- people who have the most. But inspired by the desire to help the homeless and those who need the most, McKinney also provides housing to the desperately poor. In 1998, McKinney and his wife founded The Caring House Project Foundation on the premise that stability begins at home. The Foundation now includes elements crucial to self-sufficient existence where poor and homeless no longer have to count on government or charities to sustain and improve their lives. The Caring House Project Foundation builds entire villages that provide housing, education, clean water, renewable food sources, community centers and clinics in Haiti, the poorest county in the Western Hemisphere. McKinney hopes his 2007 Badwater race will motivate others to make donations to support this worthy cause. This year, McKinney has a race plan that has been honed by his prior attempts. Being in the third and final start wave, he's starting with the fastest runners in the race, well after most of the other racers. Despite being at the back of this pack, and thus one of the last in a long line of runners stretching over some 20 miles of Death Valley even at this early stage of the race, he exercises patience and sticks with his plan. He's running well but takes his planned break at Furnace Creek. Conditions are good and McKinney is several hours ahead of schedule through the first few timed stations. Soon though, he is paying the price for going out too hard. Panic sets in at the top of the long climb up to Towne's Pass, nearly 60 miles into the race. He lays on the ground, can't keep food down, and things are spinning. This continues for quite awhile and McKinney fears the worst, no buckle or maybe even not finishing. But his seasoned crew doesn't panic. They turn things around. His team is led by wife Nilsa who handles all the logistics for the crew. "She would do fine at Camp Pendleton," says McKinney, "It's a military operation." 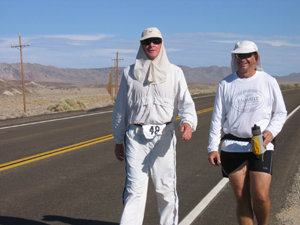 It is mandatory for each of their crewmembers to go to the Badwater website and read all the articles. "It's a wonderful resource for people coming for the first time or the 10th time." His crew has faith in him and McKinney responds. "With a little faith and the passage of time, it's amazing how you can bounce back, and I didn't learn that until I came out here." Back on plan, McKinney's training begins to pay off. He does his heat training by logging miles on a treadmill in a special room he's built in their home in humid Florida. McKinney has created his own little desert ecosystem that simulates the heat and draws down the humidity to about 10%. He progresses steadily through the night and passes the halfway point near sunrise. By afternoon he's at mile 90, heading towards Owens Valley and the next landmark time station at mile 122 in Lone Pine, which he reaches about 90 minutes after midnight. A quick stop and he's off for the 13 mile climb to the Mt Whitney Portal and the finish line. McKinney earns his second buckle and third finish in a time of 44:31:35, which he recites to the second when asked after the race. "In this race, there's two classes. There's maybe the top five men and women that have a shot (at winning) and the rest of us just survive. I've finished in 48, 43 and 44 hours. I kinda know where I belong." It's a pretty nice place to be.